Whether you have marble, tile or hardwood floors, you may have had difficulties cleaning them before due to an uncertainty or fear of incurring any damage to the flooring material. However, now with the assistance of Deccan floor cleaning services dubai, you can be confident that your precious flooring will be cleaned in the most precise and safe method possible, without the risk of any of damage. Deccan Services Dubai’s professional marble floor and surface care and maintenance services for residential properties include expert interior and exterior cleaning and sanitizing, honing and polishing, repairs, sealing and protection, and more. Is your marble floor too dull or too shiny? Call Deccan Cleaning Services Dubai and specify the finish you need. If you have a new floor with some tiles that look more glossy than others – let “Deccan Services Dubai” even out the finish for you. Whether you have or are seeking to acquire a gloss, semi-gloss or matte finish, Deccan Services Dubai can deliver a beautifully restored or changed marble finish. Deccan Floor Cleaning specialists have a cherished and respected history in the field of cleaning and maintaining flooring of all types, with an expertise in both natural and synthetic flooring. Stains form because of the minerals and iron deposits found in natural stone and the elements, but we can help with this – contact us today! 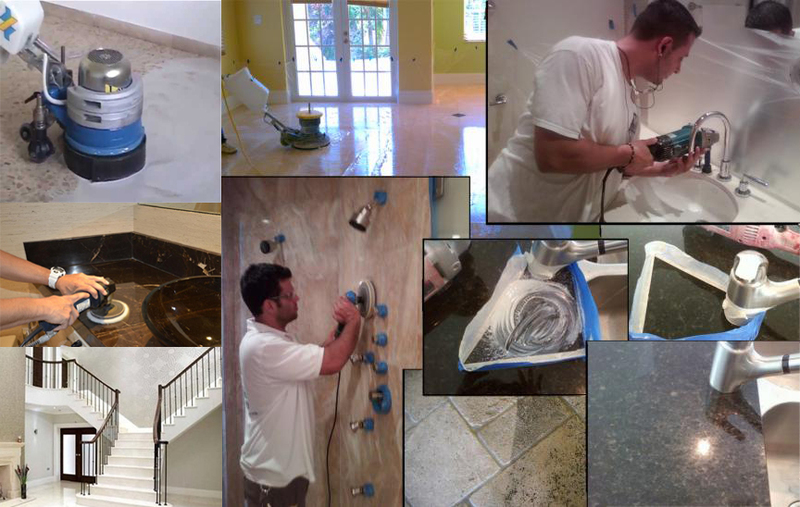 Deccan Services Dubai can remove marble stains, as well as marble discolorations. Whether you are seeking guidance on how to do this yourself or want “Deccan Services” to treat your marble, the original finish of your stone can be restored. Does your marble floor have dull areas associated with wear patterns, scratches, etches or spots? Deccan Services Dubai can hone your marble surfaces to eliminate these imperfections, resulting in a new marble surface free of damage. With our marble honing services, our expert technicians can achieve a honed or soft matte finish that is warm, inviting, and velvety smooth. Once your marble floors, showers, tub surrounds, walls, and other marble surfaces are restored, we highly recommend you have us seal them to enhance their stain resistance. All stones (unless resined) are naturally porous. If left unsealed, there’s always a risk of spilling a colored or reactive liquid, discoloring your stone. While most stains can be removed, marble stain removal can be a time consuming, expensive and often frustrating process. Sealing represents an inexpensive, preventative measure against marble stain damage. Our wax stripping service removes old dirty wax from your stone and places a new fresh layer in order to promote lasting shine and beauty. Are your marble tiles uneven? Do you want your tile floor flattened to the grout lines to facilitate easier cleaning? Deccan Services Dubai can grind away the excess stone (a process called lippage removal) to create a flat, level surface using state-of-the art diamond grinding technology. Once ground to the level and shape desired, the marble is honed and polished to the finish you want. Over time, marble surfaces and edges can become scratched and uneven; this service fixes that. Lippage removal can also eliminate some of your worst scratches and floor stains. Marble is prone to etch marking because of its calcium carbonate makeup. As acid reacts with the calcium carbonate, it eats away at the surface. Contact us for a fix! Cracks and chips in natural stone tend to get worse fast, so it’s important that you contact us soon for treatment. The services we offer shouldn’t be confused with “cleaning” although we do offer a stone cleaning and polishing service. Marble and natural stone restoration is a highly skilled job as stone can be ruined very easily by an inexperienced tradesman. You will find a lot of “cleaning companies” offering this service and using extremely harsh abrasives and acids to destroy your stone for you. When this occurs we can usually fix their problem but it can cost a lot more to sort out. Get the marble and stone restoration done right first time, call us at +97150 484 7911 or +971 4 254 6128. How Often Marble Polishing Service Required? When your marble has lost its shine and brilliance due to daily wear and tear or as a result of recent damage, contact Marble Cleaning Dubai today for a free marble restoration and polishing consultation. Interested in a free quote? Give us a call on +971 50 484 7911 or 04-254 6128.